See below for homes available in Laurel or use the “Interactive Map Search” above. 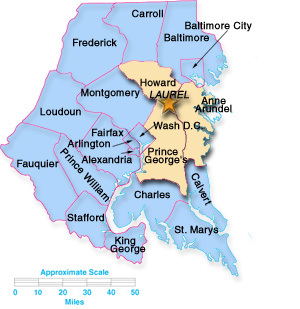 The city of Laurel and its surrounding areas have grown to encompass Prince George’s County as well as Howard, Montgomery, and Anne Arundel counties. Homes for sale in Laurel are within residential areas, often surrounded by bustling commercial areas. Situated just off Route 95 and midway between Baltimore and Washington, DC, it can be a good location for commuters looking for lower priced houses than what may be available in Howard and other counties. 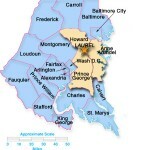 Employers such as the Department of Defense, the Fort Meade Army base, The National Security Agency, and Johns Hopkins University’s Applied Physics Labs, make their home in the Laurel area. Laurel Park, a thoroughbred horse racetrack, is located just outside the Laurel city limits. As with many Maryland towns and cities, Laurel has retained a historic district, centered on its Main Street, with sites tied to its industrial heritage. Laurel was founded as a mill town in the early 19th century. The arrival of the Baltimore & Ohio (B&O) Railroad expanded its local industry as the city became a popular home for Washington and Baltimore commuters. Welcome home! This large stately three bedroom, two and a half bath, two story brick front colonial is located in the established and highly sought after neighborhood of Cherry Tree Farms in Howard County. This home offers it~s new owners quick and easy access to NSA/Fort Mead, Washington D.C., and Baltimore and one of the highest ranked public school systems in the country. This spacious house is situated on a corner lot and boasts several builder optioned upgrades that include a two story entryway, large bright sunroom with vaulted ceilings, a home office/library (easily converted into a fourth bedroom), and a sunken family room with vaulted ceilings.The expansive 100% footprint unfinished basement is waiting for your ideas. The possibilities are endless. Both HVAC systems and windows and doors are newer in age. Don't miss a rare opportunity to experience the best this desirable area has to offer! Beautifully maintained Howard County townhouse. Updated kitchen with granite, new appliances and new flooring, new energy saver washer and dryer, new half bath in basement, new windows and sliding glass doors, new deck flooring and railings, new water heater-2015,new roof-2012, new heat pump and HVAC-2010. French drain installed in backyard! Fenced in yard. View to trees. 1 assigned parking spot. M/I Homes, new home under construction, At least one occupant must be 55 or better* community in Howard County near Maple Lawn. Villa style homes, MBR suite on main level , plus 2 bdrms, loft, full bath up, Full bath Lower Level,2 car garage, Walkout basement foundation. 15 year transferable structural warranty, 100% Energy Star Certification. *See your New Home Consultant for additional details. Backing to trees and green space and located in the sought after gated community of Stone Lake, this stunning 4 bd, 3.5 bath villa offers over 4k sq ft of luxury living space and a 2-stall garage. Hardwood floors throughout the main level lead to a classic modern white kitchen with abundant sunlight, loads of cabinets, granite countertops, SS appliances, and plenty of room to entertain. A spacious breakfast area and French doors open to the composite deck and green space. The elegant and extra thick crown molding accentuates the 10 ft ceilings and adds character to the main level and upstairs hall.The second level features 9 ft ceilings, 3 bds, 2 full bths, a conveniently located laundry room, and lots of storage space. The spacious master bedroom has two large closets, enough room for a sitting area, and lots of natural light. The neutral d~cor in the sizeable master bath offers you a chance to relax in the whirlpool soaking tub or oversize shower. The lower level also features 9 ft ceilings, a 4th bd, and full bth. The vast recreation room has unlimited possibilities and you~re sure to enjoy the high-end surround sound projector theatre system.This well maintained and fully equipped home boasts many upgrades including extra thick crown molding on the first level and second level hall, custom blinds, a built-in surround sound theatre/projector system in the basement, Trex composite deck and steps leading to green space, hardwoods throughout the main level, 42 in cabinets, and more.Bordering forest conservation and the Patuxent River, the walking paths provide sensational views of beautiful Stone Lake. You~ll also find a community boat house, sandy beach, private fishing docks, a floating deck, gazebo, pavilion, an outdoor fireplace, and amazing playground. Bring your kayak or canoe and launch it from the boat ramp. Play tennis or putt on the green after work. Served by top ranked Howard County school system. Location is ideal for commuters to both Baltimore and Washington, D.C. Welcome home! Are you looking for a garage townhome with lots of flexibility? Take a look at this beauty! Four bedrooms, two full baths AND two half baths give you the space you need. Located in Bowling Brook Farms, this home offers you the ultimate in convenience too. Only minutes from Routes 1, 32, 95 and the B/W Parkway. Enjoy the tasteful updates and a deck/rear yard that backs to the privacy of woods. The historic Savage Mill is so close and the Howard County school system is top notch in the State of Maryland. Make an appointment to take a tour and prepare to fall in love. PUBLIC ONSITE AUCTION: Wed. Apr 24 @ 1:00PM . List Price is Suggested Opening Bid. Single Family Home in the Laurel area. Howard County. Conveniently located between I-95 and Route 1 Property is Vacant. 10% Buyer's Premium. Deposit $10,000. For full Terms and Conditions contact auctioneer~s office. Stunning elegant 5 BD, 5 1/2 BA, 3 cars garage, colonial Craftmark home (built 2008), with 6,873 sq. ft of finished living space nested in James Town II landing facing East. Home features crown moldings, chair railing, high ceilings and recessed lighting, with hardwood floors on entire first level. Impressive entry foyer leads into extra large family room with a fireplace and breakfast area on one side and study on the other side. Open gourmet kitchen with center island, stainless appliances, cherry cabinets and a chef pantry is a lovely gathering place for large familiesUpper level includes a luxurious MBR suite with a separate sitting room and spacious attached bath which leads into extra large walk-in closet for Him & Her. Second master bedroom on upper level plus two large naturally lit bedrooms .Additionally there are three large naturally lit bedrooms, laundry room on upper level plus attic bedroom with full bath. Fully finished walkout basement with a full bathroom allows for home theater, game room and other recreational activities. Excellent location in the highly coveted Howard county school district, near Mini-golf course, off Rt-29 and close to I-95 and MD-198.This home offer quality and value ! MUST SEE !!! OPEN HOUSE SUNDAY 12-3pm (APRIL 14th) Come and see this beautifully updated rancher in North Laurel, Howard County! Features include an open and remodeled kitchen, finished basement, sun room addition, 2 car detached garage, trex decking overlooking the level back yard, and recently installed HVAC units. Close to major roads, shopping, parks, and entertainment. Gracious and spacious colonial on level .45 acre lot. Over 3400 sq ft on the main and upper levels featuring large rooms and an open feeling throughout, Freshly painted in a neutral palette with new carpeting and lighting fixtures throughout. Two story foyer with hardwood flooring opens to a study on one side and formal living and dining rooms on the other. Sunroom with tile flooring and 5 palladian windows and a cathedral ceiling is just off the living and dining rooms. Kitchen has hardwood floors, large cook island, plentiful cabinets with desk area, and room to accommodate a large table for dining with a view of the private backyard. Family room has vaulted ceiling and wood burning fireplace, An atrium door provides access to the deck. Upper level showcases large bedrooms includng the master at 21x14 and another bedroom over the garage at 18x18. Basement is finished with a rec room 28x14, a full bath and unfinished stprage areas measuring 16x21,45x28, and 16x21. Plenty of space for hobby room , organized storage, or another bedroom or office. Roof replaced 2018 and hot water heater 2018. Home conveys with a one year HMS Premium warranty. Clean and ready for quick occupancy. Choice Howard County schools and ideal location for the Baltimore or Washington commuter with easy access to routes 216, 29, and 95.